After scoring in the 2-D Cajun-realm of THE PRINCESS AND THE FROG, composer RANDY NEWMAN switches gears into the third-dimension for this latest soundtrack release from WALT DISNEY RECORDS. 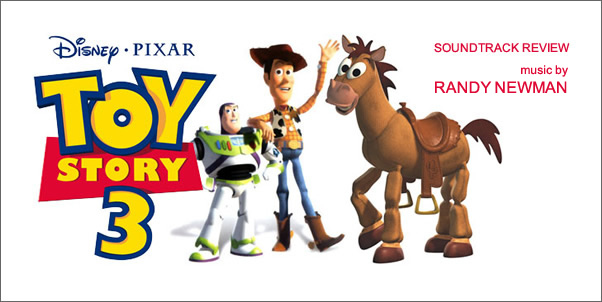 TOY STORY 3 is the latest original score from NEWMAN, veteran composer for some of DISNEY-PIXAR's finest cinematic efforts. It's his 6th soundtrack contribution for PIXAR, which includes the the entire TOY STORY trilogy. For TOY STORY 3, NEWMAN imports Latin elements into the project, which is new territory for the franchise. While the added diversity of the music made for an initially entertaining listen, I found some transitions within some of the individual tracks to be very capricious, which plays out well on-screen when you have the visuals of the movie, but works against itself when it comes to a stand-alone soundtrack. If anything, the randomness adds more humor and wit to the entire soundtrack than was meant to be conveyed along with the movie. For most part, the identifiable Themes, & their usual Randy Newman Re-arrangements, such as the Upbeat Instrumental version of 'When Somebody Loved Me'(Jessie's Theme), I felt like there was a little too much copy and paste going on. Randy Newman's fantastic, but as much as I love re-hearing themes, I think this is a bit demeaning for Randy's reputation. There were a few times, I heard this as well with some String runs (used in moments when he's 'playing the action'), I instantly recognised them, because nothing at all were different about them.